A few days ago I mentioned hairy bittercress and that it was growing in my yard. Since then I've checked back on The 3 Foragers' blog and found that I was not using it to its full potential! Yesterday we had friends over for dinner so I tossed some into a salad of regular lettuce, cucumber, mango, tomato, and goat cheese. It was very good, but the peppery taste of the bittercress was lost. 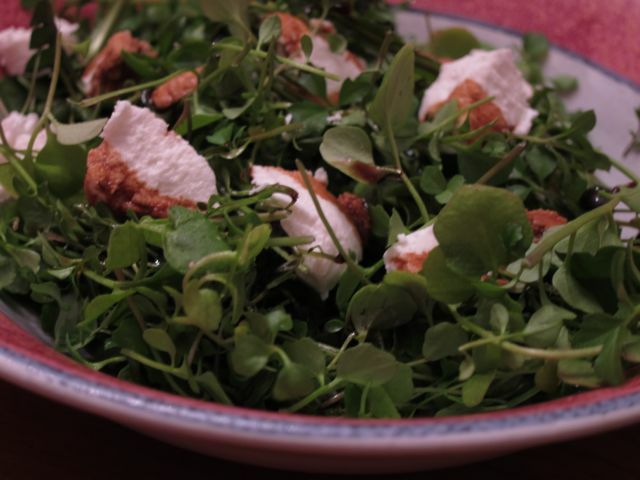 So today, following their example, I made an entire salad of just bittercress, plus a couple of young dandelion leaves, and goat cheese, drizzled with balsamic vinegar. It was sharp and a little stronger than anticipated. Perhaps there is a happy medium somewhere? For last night's dinner we also marinated 2 pounds of shrimp in a cup of the Mango Blackberry BBQ sauce and grilled them. The shrimp were excellent!